James Dickson Pollock (1886-1936) – Temple Lodge, No.33, Duncan, B.C. James Dickson Pollock (1886-1936) served as Lodge Organist from 1923 until 1933, when his name disappears from Temple Lodge, No.33 Lodge membership records. He was a manager and shareholder of the Hillcrest Lumber Company, which is no longer in business but, in its day, was a leading player in the Cowichan Valley lumber industry. We will do more research in our records to see if we can find out whether he demitted from the Lodge prior to his death in 1936. His obituary in the local newspaper (see below) does not mention his Temple Lodge, No.33 membership and only lists one Freemason, John Albert Kyle, attending his funeral, although it notes that his funeral was well attended, with 103 cars counted at Mountain View Cemetery for the funeral. We will do more research on James Dickson Pollock and post any information we uncover. “Pollock – Mr. James Dickson Pollock, manager for the Hillcrest Lumber Co., died on Friday in the King’s Daughters’ Hospital, Duncan. He had been in hospital several months. He was 49. Mr. Pollock leaves his wife, the former Miss Gladys Bell, and eight children: Jean, Robert, James Stuart, Mary, William, Helen, Lawrence and Richard. Also surviving are two brothers: Mr. Andrew Pollock, Flin Flon, Manitoba; and Mr. John Pollock, Union Bay; three sisters, Miss Christina Pollock, Summerland; Mrs. Olivia Smith, Summerland; and Mrs. A.H. Barker, Cloverdale; and a sister-in-law, Dr. Lelah Pollock, Portland. Mr. Pollock was born in Paisley, Scotland, and trained as a book-keeper and stenographer, winning several prizes for speed and proficiency. About 25 years ago he came to B.C. and entered the office of a lumber company at Barnet, near New Westminster. Following this, he was in the office of the Island Lumber Co. here, and in 1912 became book-keeper of the Hillcrest Lumber Company, acquiring an interest in it some years afterwards. There was a large attendance on Sunday afternoon at St. Andrew’s Presbyterian Church, Duncan, and at the graveside in the United Church Cemetery, Somenos, where 103 cars were counted. Mrs Firth, sen., was organist, and the hymns were, “Jesu, Lover of My Soul” and “Forever With The Lord.” The Rev. E. Barnes officiated. The pallbearers were Messrs. John Pollock, Union Bay; A.H. Barker, Cloverdale; Claud Bell, Penticton; and Jack Drew, J.A. Kyle and Len Traer. 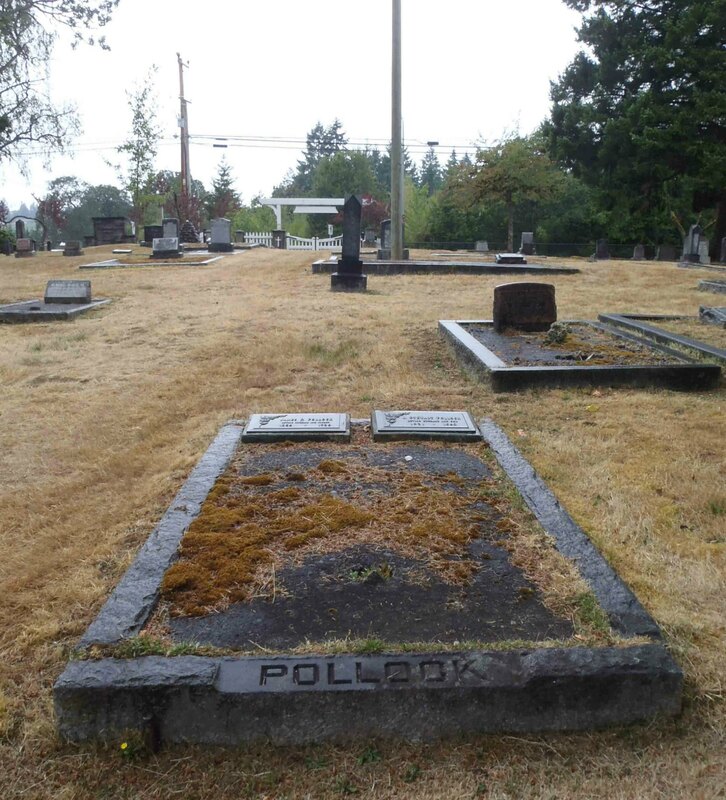 James Dickson Pollock is buried in Mountain View Cemetery, North Cowichan. James Dickson Pollock grave, Mountain View Cemetery, North Cowichan, B.C. 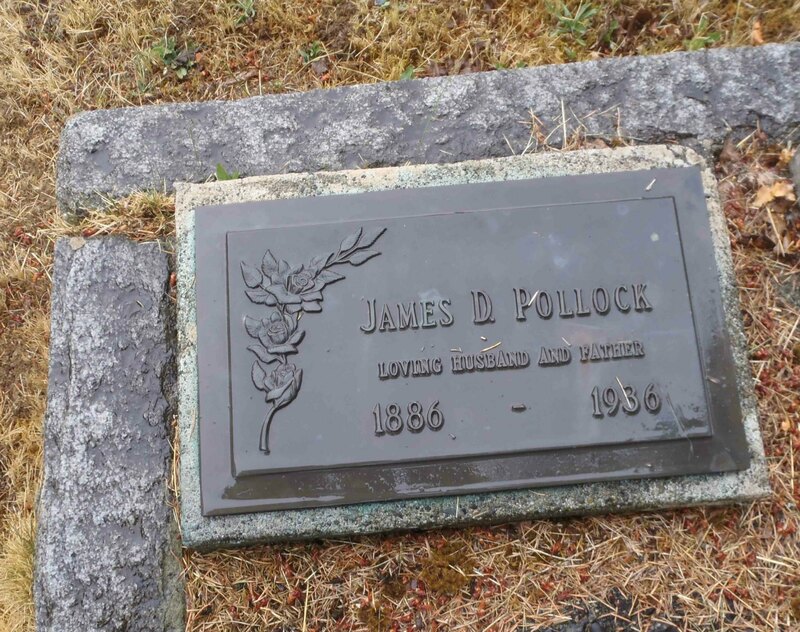 James Dickson Pollock grave marker, Mountain View Cemetery, North Cowichan, B.C.